Jon and Patty’s recipes originally came from their home. They wanted to cook for their customers the way they did in their lives, and so developed a theme: Fresh, healthy, creative and affordable neighborhood bistro fare. When they were both in college, Jon and Patty met at a restaurant called The Crab Trap where Jon was the dinner chef. One night, Patty was at the bar with some friends and she met Jon, who was filling in for a bartender. That night the restaurant owner told Patty, “You’re going to marry Jon some day.” Patty laughed. A week later Patty visited the bar and saw Jon there, having an off duty drink. She bought him a drink and the rest, as they say, is history. 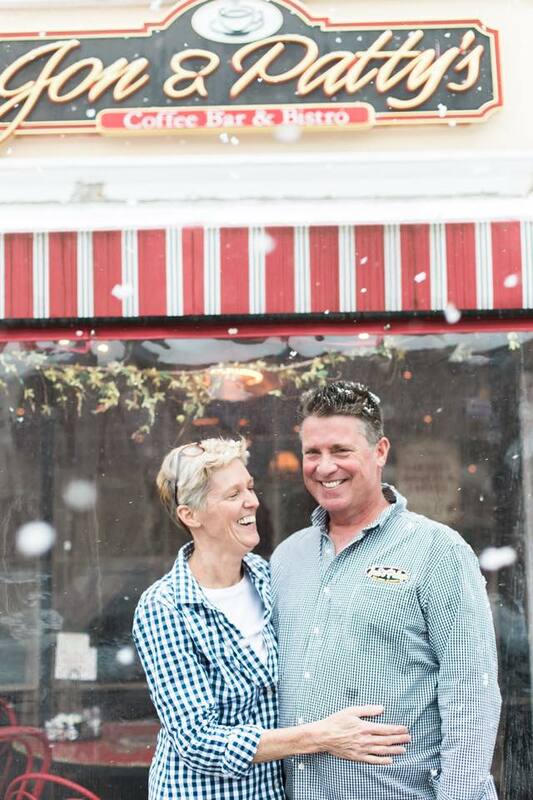 After they met, Jon and Patty worked together as chef and dining room manager respectively at The Back Burner, a restaurant in Hockessin, Delaware. They got engaged there. The restaurant is still in business nearly 30 years later and has become a universal shrine to love won and kept in the culinary world…. just kidding. Here are a few fun things we pride our selves in. We are always quality over quantity, but some of us are numbers people, so here you go! Come and go as you please, but one trip to Jon & Patty’s will have you feeling like family. Join our mailing list to stay up to date on all the fun things we have going on throughout the year!